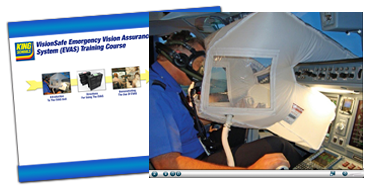 The EVAS® is a self-contained system that allows a pilot and copilot to see flight instruments during a smoke in the cockpit incident. The entire EVAS system is contained in an aluminum container that weighs approximately 6 pounds. This training course will teach pilots to understand and use the proper procedures for EVAS deployment. All of the components of the EVAS system and their functions. When the EVAS system should be armed and deployed. How long the system will function during an emergency. What actions the system enables a pilot and copilot to take during a smoke in the cockpit emergency. Upon completion of the EVAS course a completion certificate will be issued that may be required by your operational specifications or your insurance company. Ensure pilot vision during emergencies when dense smoke in the cockpit cannot be stopped. Work with oxygen system and smoke goggles (not in place of them). Provide view of primary flight instruments (basic "T"). Allow instrument window to be shifted right or left to view adjacent instruments. Provide view of the flight path. Provide the ability to read approach plates and emergency procedure checklists. Provide a "last ditch" chance to save the airplane and occupants. Cover engine instruments and controls, electronics panels and controls, or overhead or console installations. King Schools and VisionSafe are collaborating to create an easy to use, interactive, multi-platform course. For more than 40 years King Schools has been an aviation industry’s leader in education. King Schools has provided training to more than half the pilots in the United States! How big a problem is smoke in the cockpit? As an airliner cruises it is twice as likely to land due to a smoke event as from an engine malfunction. Smoke is the leading defined cause of unscheduled landings of long-range commercial aircraft. According to a report from the Airline Pilots' Association (ALPA), during a 10-month period, there were three smoke events per day. Indeed, there was one unscheduled landing per day to prevent the potential consequences of not being able to see to land because of smoke in the cockpit and that was from only one of several databases that report such events. Is there any technology that will permit a pilot to see when smoke in the cockpit cannot be stopped and is too dense to see through? Yes. It is known as "cockpit smoke vision system" EVAS® (Emergency Vision Assurance System) is the only equipment in the aviation industry that allows pilots to see through smoke in the event of an emergency situation where the cockpit is filled with dense, thick smoke. If EVAS® can permit pilots to see in the presence of blinding, continuous smoke, why hasn’t the Federal Aviation Administration (FAA) mandated it for the airlines? FAA has retrofitted its own fleet of aircraft with EVAS® to meet AC 25.9a recommended standards for smoke control. Are there any aircraft that fly with EVAS®?